Tempura Kondo is a favorite of Michelin critics and enjoys guests from the world over. 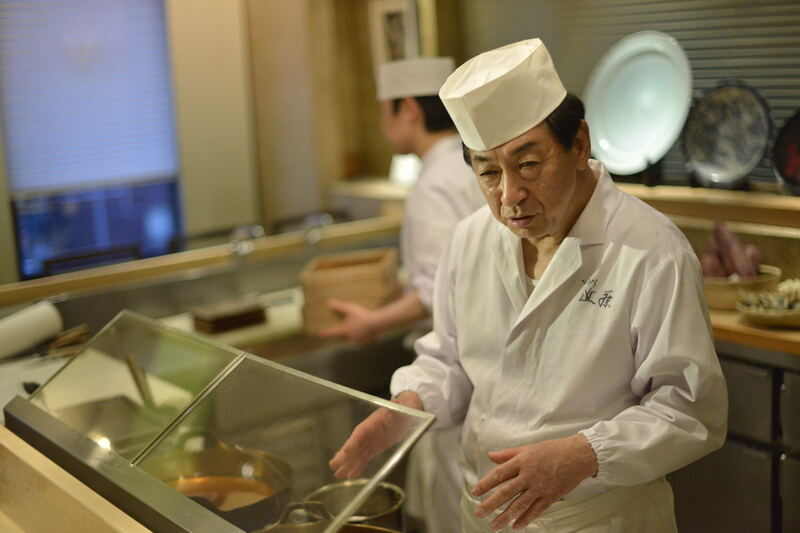 Mr. Kondo, the chef, spent twenty-one years working at the Tempura to Washoku: Yamanoue, the Japanese restaurant at the Yamanoue Hotel in Kandasurugadai, Tokyo. In 1991, he went solo, opening his own restaurant that has become known for original ideas like his lightly fried concoctions and the use of vegetables in tempura dishes. Just what are Mr. Kondo's lifelong aspirations for tempura? We sat down to learn the details. 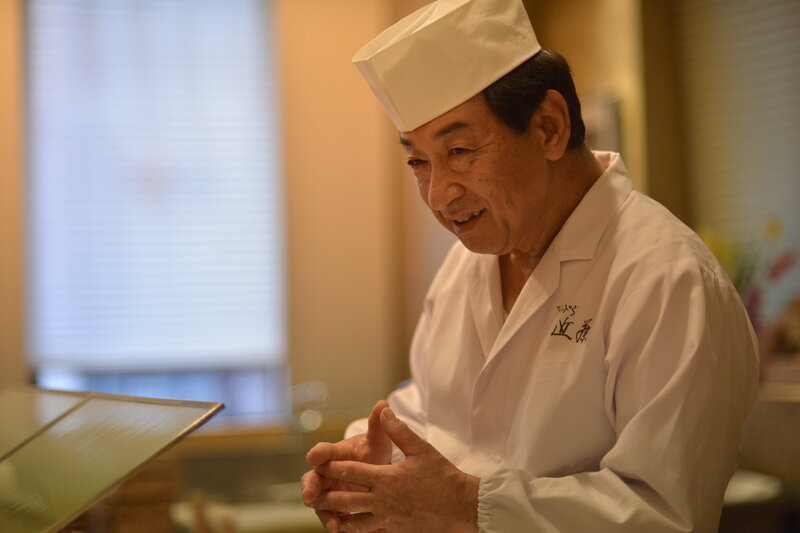 On a job interview, Kondo was told that he had a “face made for Japanese cuisine.” Thus his future was decided, with a position in the Japanese restaurant of the Yamanoue Hotel. Items include a whole sweet potato fried at low temperature for 30 minutes, carrots that resemble flowers, sliced thinly and fried for but an instant, thick asparagus with a crisp crust and a fresh, moist inside. Vegetables feature prominently in Mr. Kondo’s tempura. Traditional tempura in the old capital of Edo eschewed vegetables in favor of seafood. In olden times, it was also unheard of to use a thin crust and minimal oil for a light tempura that brings out the flavor of the ingredients. Mr. Kondo developed this unique style at the Yamanoue Hotel, where he first entered the workforce at age 18. Did you join the Yamanoue Hotel with aspirations to become a tempura chef? Of course not! (laughs) My father died when I was in elementary school, and I did help my busy mother with the cooking from a young age. We boiled rice with firewood. Cooking was familiar to me, but the extent of my motivation was that I’d never go hungry if I was a chef. After graduating from a vocational school, I didn’t have any idea if I’d go into Japanese or Western cuisine. On my interview at the Yamanoue Hotel, its founder and then-president Toshio Yoshida told me that I had a “face made for Japanese cuisine.” With that, I was assigned to the Japanese restaurant. I was first given a chance to prepare tempura about six months into the job. Did you learn the art of tempura from your senior colleagues there? The tempura cook at the hotel decided to go solo and resigned, and there were no senior staff to take over the job. So I had to independently learn tempura myself. I used my meager paycheck to collect books on the subject and train outside of working hours. The plus of taking this on myself is that I wasn’t told to do one thing or another by the management, and I was able to explore my ideas freely. My real master teacher is the customers. The Yamanoue Hotel was regularly frequented by such cultural greats as author Shotaro Ikenami and photographer Ken Domon — these gourmets must have contributed to helping refine your skills. They definitely gave me certain hints about what kinds of cuisine are considered appealing. Messrs. Ikenami and Domon did not comment or criticize the food. Instead, I relied on patrons’ expressions when they ate the food and their progress with the meal to get a sense of if they’d liked it. No matter who the patron may be, when you become a chef, your duty is to satisfy all diners. I knew that even as a newbie, so I always endeavored to check people’s reactions. All the same, having such famous greats take a liking to you at a young age was a testament to your winning personality. Were you always a skilled communicator? Quite the contrary. I was tight-lipped. Can you believe it? (laughs) I learned the art of conversation,because I noticed that unless I developed the art of conversation, patrons would not feel at ease. Today, I can freely talk off the cuff when doing food programs on TV, all without looking at the script. At twenty-three, Kondo was appointed to the role of head chef. 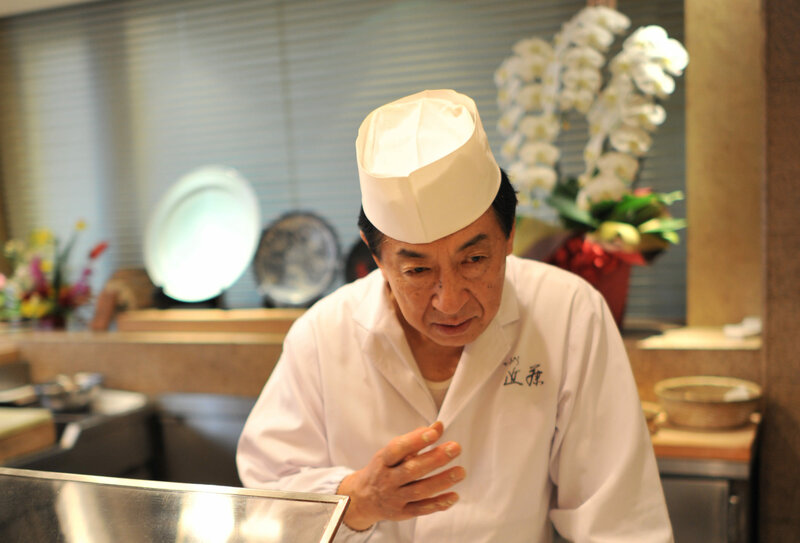 The popularity of his tempura had made the Yamanoue Hotel’s restaurant into an operation grossing 300M JPY a year. Kondo says he first started actively incorporating vegetables in his creations after being appointed to head chef of Tempura to Washoku: Yamanoue at age twenty-three. When he first joined, the restaurant made revenue of 1M JPY a year; if anything, it was a nuisance to the balance books of the hotel. 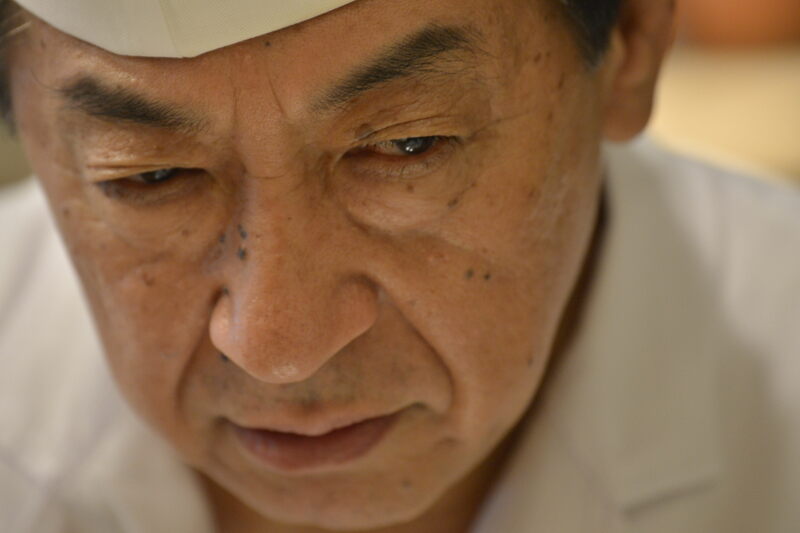 In his fifth year with the restaurant, Kondo was appointed to a major role, and he set out to try numerous restaurants, research cuisine, and refine his style. He noticed that most tempura establishments barely used vegetables. Were vegetables really not used back in those days? Young people may not be aware of this, but there was the idea that fried vegetables were something you’d find at the deli. So they were strictly off the menu at finer establishments. But I felt that we absolutely had to incorporate vegetables. They scolded me: “We didn’t come to eat appetizers.” They also told me that making a light crust on vegetables was “not tempura at all.” But the thing of it is, tempura in those days was thick and loaded with oil — it was a sticky affair. Keeping the oil at a minimum would bring out the ingredients’ true flavors for patrons to enjoy. That was my conviction, so I held fast to it. Green asparagus makes a regular appearance on your menu. Where did you get the idea to use Western-style vegetables in tempura? Since I was employed at a hotel, I would pop over to the Western-style restaurant to lend them a hand when they were busy. At the time, green asparagus was a rare delicacy in Japan, and I encountered it for the first time while still a beginner. It remains juicy even when grilled, and it’s colorful — I added it to the menu, thinking it could become a mainstay of tempura. This was quite a bold move, but patrons loved it. 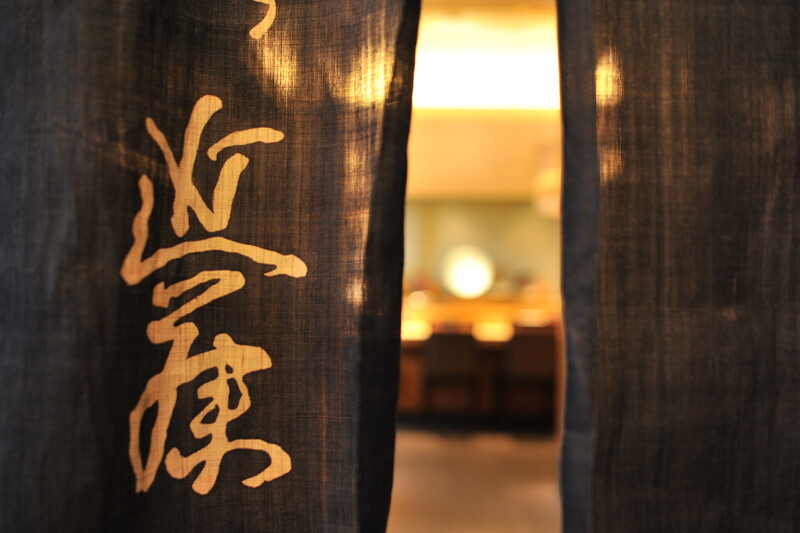 Your tempura made waves, transforming Yamanoue into a profitable establishment. It had considerable revenue, did it not? Over the twenty years I was employed as head chef there, we never once failed to clear our revenue targets. Not once. Pretty amazing, huh? (laughs) I grew the restaurant from one barely earning 100M JPY a month to one making 300M annually. You supported the growth of the hotel from the ground up, in other words. It must not have been easy to, as chef, have to focus on both revenue and on pursuing the refinements of taste. What was the secret to making the shop financially successful? Not compromising when it came to the quality of the ingredients. Many people make the crucial mistake of trying to increase margins by reducing the cost price. Chefs are obedient to their bosses, so they do exactly what the management tells them. But it should be the other way around. Customers aren’t going to come if you decrease the quality of the food through lesser ingredients. If all you think about is margins, you will never grow. Even with a steep base price, if the food is delicious, more customers will come, and eventually that base rate will drop as the shop becomes profitable. The most important thing is actually delivering food that you think is delicious and that you can stand behind. That’s precisely true, but the management will pursue profits; it is in their job description. Did your opinions ever get out of step with the hotel management? Constantly! I did not play nicely. (laughs) Now that I’m independent, I’m at liberty to say this, but I trimmed my own wages in order to allocate more budget to buy better ingredients. It was something close to 10M JPY at today’s rates. On my own. Let’s be honest, you can’t use already dead shrimp. It has to be prepared live. Customers can understand the difference. However, I can’t necessarily recommend docking your own wages to the public at large! I was totally committed to the enterprise of cuisine, so I spoke my mind to the president of the hotel and did so openly. Naturally, I was lucky to have a broad-minded boss. I remember even today how, as best man at my wedding, Mr. Yoshida gave a speech saying, “Kondo and I fight at times, but it’s all for the sake of the shop.” We were very close.